The Nissan Qashqai is a great looking car and with a very strong engine. We’ve found the 2.0DCi model is currently manufactured with the DPF (Diesel Particulate Filter) and our main concern is the size of this filter. The filter is installed in the centre box of the exhaust and this in itself is an issue because the further down the exhaust it is, the lower the temperature of the exhaust gasses are before they reach the DPF for a regeneration. We believe the filter would have been better suited mounted directly on the downpipe but we can see that space was an obvious issue in the design of this vehicle – but then how have other hatchbacks achieved this..? To learn more about the DPF system, please see our Diesel Particulate Filter (DPF) Problems & Solutions article. Fault Code: P1435, P1436 & P0611 etc..
Once the DPF has failed to regenerate and blocks up on the Nissan Qashqai, the light will not go out without having it reset and Nissan currently charge £250+ Vat for this service whilst carrying out a forced regeneration, however, after doing so it is strongly advised you must carry out an oil & filter change because it will dump fuel in the oil to raise the temperate and this then will cause lack of lubrication and can also lead to over pressurising if you’re not careful. Why Not Regenerate My Nissan Qashqai Blocked DPF? Regenerating the DPF if it becomes blocked is not such a bad thing, if it’s the first time you’ve experienced problems but if it has been regenerated once already and the light is back on, then you’re only real options are a new filter or a DPF Removal because regenerating it again will only potentially lower the life expectancy of your injectors and at the same time damage the elements of the already blocked filter so it will block up a lot quicker the next time round. A blocked DPF can quite quickly turn into a very expensive repair if it is not dealt with immediately. Is There Not A Permanent Solution For A Blocked DPF On A Nissan Qashqai? There is indeed a permanent solution and that is to have the complete DPF system removed and de-activated from the vehicle. This will ensure the vehicle will not lose power, no warning lights (DPF Related) will come up and the vehicle will not attempt to regenerate but best of all, there will be NO DPF on the vehicle meaning nothing to block up and so you can drive the vehicle how YOU want to drive it and not have to worry about doing it any harm. How Will SINSPEED Remove My Nissan Qashqai DPF? 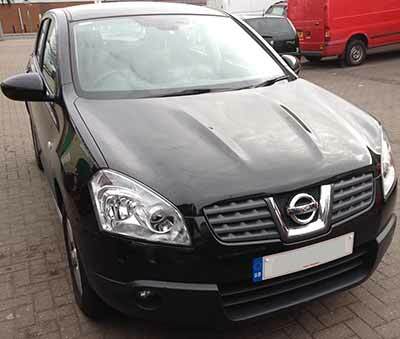 When your Nissan Qashqai comes into our workshop we start by deleting down the fault codes and downloading the Engine ECU map files to begin manually decoding and de-activating the complete DPF system. We offer a CUSTOM DPF Removal session and do not use any kind of automated softwares in our process, this eliminates the possibility of problems which many people come across after having their DPF removed by mobile tuners. Whilst the software is being manipulated, we take your vehicle into our workshop to have the filter physically removed from the exhaust system and at the same time carry out a full visual inspection over the vehicle to see if any other faults are occurring just to ensure you peace of mind that after your vehicle leaves our workshop there are no other problems and if there are, we can notify you and quote you accordingly – Yes, we do carry out general mechanical repairs & we’re very cost-effective! After reprogramming the Engine ECU with the new Custom DPF Removal software, we then proceed with a FREE Smoke-Correction service to ensure the vehicle won’t smoke and it will continue to pass an MOT – This is our guarantee and something that currently NO other company in the UK can offer! What Is A CUSTOM DPF REMOVAL Session? By Custom we mean after downloading the map files and decrypting them from the Engine ECU, we manually scan through the 1000’s of data strings to locate and delete all locations of the DPF map files, however, some data strings for the DPF are interlinked with other sensors on the emissions circuit such as the Lambda Sensor, Temperature Sensor, Air Mass Sensor & Exhaust Gas Pressure Sensor. Deleting these data strings will disrupt the sensors and possibly stop them from working which would also throw out the vehicle emissions and could potentially cause a lot of problems if not immediately then over time. What we do is modify all interlinked data strings to ensure that the DPF map settings are completely removed and the sensor map files are recalibrated to work optimally even without having a DPF installed on the vehicle – This ensures it will not disrupt emissions and again guarantee the vehicle will continue to pass its’ MOT. How Is This Method Different To Other Companies? Many companies and mobile tuners are found to be using “Automated Software” and by doing so, they do not manually delete and modify data strings – instead, what they do is download the map files and run it through a piece of software which attempts to automatically locate the DPF data strings and delete them but by doing so they will either purposely skip the interlinked data strings so not to cause immediate errors (this means vehicle will continue to regenerate causing damage to injectors and bore wash pistons over time) or the software will accidentally delete the interlinked data strings and corrupt the map files for the emissions related sensors causing many problems. What Can I Expect After My DPF Is Removed? After having the DPF removed from your Vehicle, it will not bring up any error messages and the car will not go into LIMP mode. Also, you will never experience any Regeneration messages where the ECU normally attempts to clean the DPF – this is because the DPF is no longer existing. Finally, you will experience an overall increase in performance, smoothing out any flat spots and safeguard the life of both your engine & turbocharger. A new DPF (Diesel Particulate Filter) will range from £700.00 – £1500.00 (+Labour & VAT). We can remove the entire DPF for a fraction of this cost and you’ll never have to worry about it ever again. For more information, please call us on 0844 847 9999. 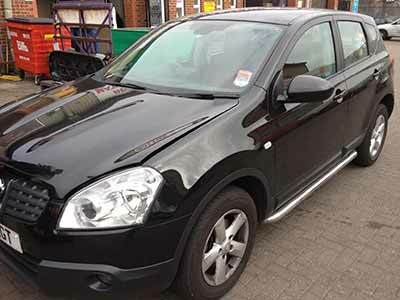 Tags : Fault Code: P0611 Nissan DPF Problems Confirmed!, Fault Code: P1435 Nissan DPF Problems Confirmed!, Fault Code: P1436 Nissan DPF Problems Confirmed!, Nissan DPF Removals, Nissan Qashqai 2.0DCi DPF Blocked, Nissan Qashqai 2.0DCi DPF Problems, Nissan Qashqai 2.0DCi Losing Power - DPF Problems, Nissan Qashqai Custom DPF Removal - Call Now 0871 2887 666, Nissan Qashqai DPF Light On, Nissan Qashqai DPF Removal, Nissan Qashqai DPF Removal - Lifetime Warranty!, Nissan Qashqai DPF Removal & Guaranteed MOT Pass!, Nissan Qashqai Regeneration Failure - Blocked DPF Solution, Removing DPF From A Nissan Qashqai 2.0DCi. Yes, we offer a lifetime warranty on our DPF Removals. We had a Nissan Qashqai come in to us earlier in the week, on average we’re seeing 1-2 a week so they are quite common and the DPF Removal is very effective and will give great benefits – Better Performance, Increased Fuel Economy, More Power and a sharper throttle response. It will also increase the life expectancy of the turbo and engine. What about Qashqai 1.5dci with DPF. Have you experienced any clients with this engine? We have done DPF Removals with this model of vehicle and no problems have occurred after the removal. Please call our office for details on 0871 2887 666 or alternatively if you send us a email, we will get straight back to you. HI IM LOOKING INTO GETTING MT DPF ROMOVED BUT JUST CAME ACROSS A TREAD THAT IF YOU HAVE IT REMOVED AND YOUR CAR GOES IN FOR A MOT TEST THAT IT WILL FAIL THE MOT DUE TO THE DPF BEEN REMOVED!! CAN YOU CONFIRM IF THIS IS TRUE. Please see our main DPF Removal article for information on this. From February there will be a visual inspection of the DPF at MOT’s and if they can visually see the DPF is missing, you will fail the MOT. Although our DPF Removal service is very discreet and cannot be visually picked up on, we offer all our DPF Removal services as an off-road use service. I have sent you an email for some further information before quoting you on the DPF removal service we currently offer. We have sent you an email with full information and pricing. We have sent you an email, please respond with your postal code for a customised quotation. 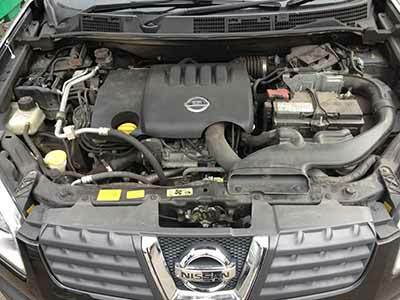 How much would it cost to remove dpf on Nissan quashqai 2013 1.6 diesel? I have sent you an email – kindly respond with your postal code for a customised quotation. Fed up with this dpf, how much to remove in a Nissan qashqai, 1.5 tekna 2011, its completely blocked and i had this problem over a year ago and want it out, the missus only does the school run in london in it, it never gets a proper run and its just going to keep happening! We have sent you an email, kindly respond with your postal code for a customised quotation. Do you offer the option to carry out the software modification without the vehicle present? I live in Austria and could post the control module. While you are doing the magic with tha ecu i can remove the DPF from within the exhaust. I know what is required to do this. The car is a 2011 2.0dci Qashqai+2. We do offer DPF Delete services in Austria, I have sent you an email with full information and pricing.